One of my earliest memories is of my grandfather reading to me. Sitting in his big chair, with his arm around me was a special time – a time of sharing magical moments when we could travel to far away corners of the world and meet amazing characters! Reading with a child can shape a child’s literacy growth whether it happens as a bedtime ritual in many homes and an important literacy-building activity in many classrooms. There is considerable research reinforcing the importance of reading with children. Bedtime stories develop critical pre-literacy skills, an early interest in books and reading, imagination and critical thinking skills. Reading with young children also develops an ability for visual processing, creating mental visual images, improving vocabulary, and processing complex language. But in many parts of the world, in developing countries and increasingly in developed nations, books are not part of a child’s early experiences. For parents who cannot read or struggle daily to care for their families, books are just not a priority. In schools where textbooks are scarce, picture books and children’s literature , sadly, are not prioritized a necessity. 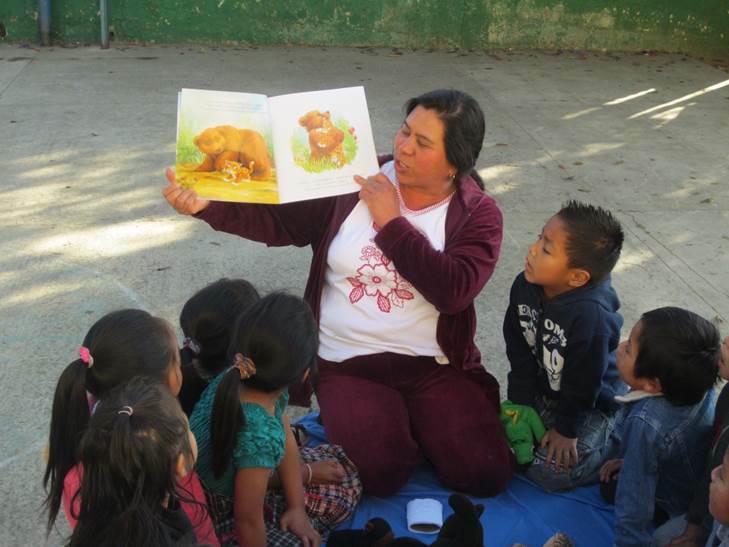 Bringing stories, story books, and literature to children and to classrooms is something Rotarians can – and should – easily do to improve access to basic education and literacy. 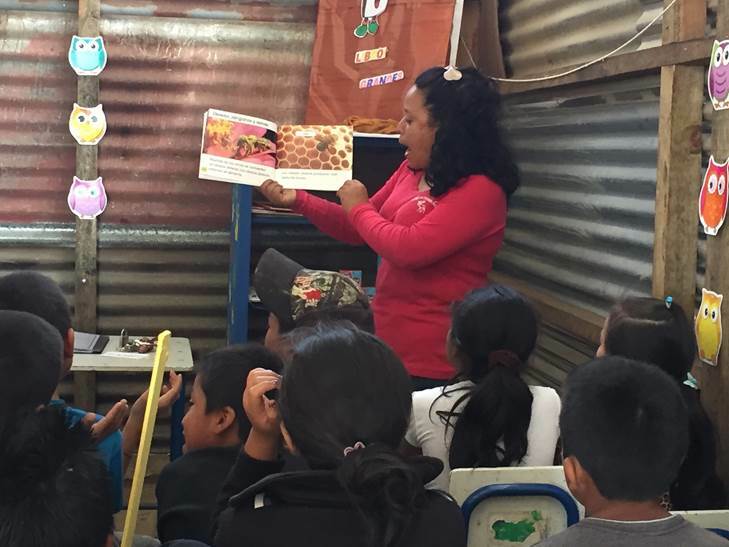 For eight years, the Culture of Reading Program (CORP) has offered teachers and students in rural Guatemala schools access to books and reading. CORP schools receive a variety of appropriate, quality children’s books. It might be assumed that teachers would intuitively know how to read picture books with their students. But, when a teacher was never read to as a child, never heard their own teachers reading aloud, and has never read to her own children – reading aloud becomes an skill that must be purposely developed. For the story books to have an impact, training and support in how to use them is essential. I am always amazed when one of our CORP teachers takes out a book and tells her students it is story time. The room quiets and every child is immediately focused on that story – the pictures, the rhythm of the words, the adventure that unfolds. How many times have I seen an older child in a first grade classroom and expected that he will have no interest in a book that is clearly for young children – only for this child to be the most mesmerized and immersed in the story! 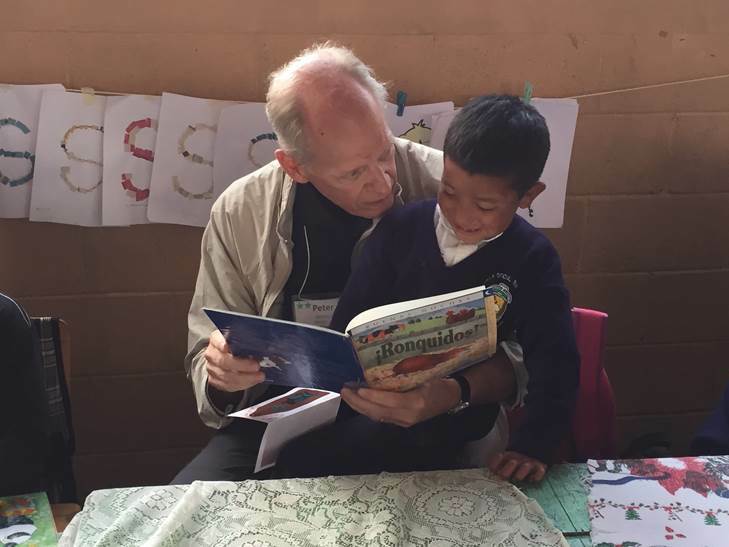 Rotarian Peter Johnson reading with a student in Guatemala. Creating a culture of reading – locally and internationally – is something every Rotary club can do. One option is to become involved in grants to provide books and training for primary grade teachers. Just as importantly, Rotarians can volunteer in their local schools and read with students – recreating that special story time so many of us experienced as children. Clubs and districts can also contact the Literacy Rotarian Action Group (LitRAG) for assistance with literacy projects. How will your Rotary club support literacy and create a culture of reading, locally and internationally? LitRAG consists of Rotarians, Rotarian’s family members, and program participants and alumni with expertise in literacy and passion for education. Contact the group for assistance with your club or districts literacy projects.